Can be fluid (like hot rubberized asphalt, BUR) or single ply; EPDM, PVC, TPO or modified bitumen. Typically extruded polystyrene. NOTE: insulation goes beneath a fluid membrane application and above a single ply membrane. A light-weight board with long-term stability and a filter fabric that allows water to pass through it will preventing fine soil to pass through it. This prevents storm water runoff by evening the flow of water of the roofing system. This protects the roofing system from vegetative root penetration. Soil or Engineered Planting Media with these characteristics. Depending on the intensive or extensive nature of the green roof. Sedum is a plant genus representing about 400-600 species of leaf succulents, found throughout the northern hemisphere, varying from annual groundcovers to shrubs. The plants have water-storing leaves. Many sedums are extensively cultivated as garden plants, due to their interesting and attractive appearance and hardiness. The various species differ in their requirements; some are cold-hardy but do not tolerate heat, some require heat but do not tolerate cold. They are preferred to grass for green roofs. Grown in separate blocks, suppliers don’t mix cells. 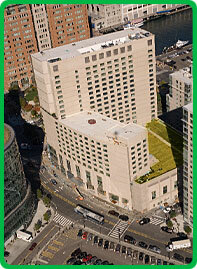 Marshall only installs green roof systems that are fully warranteed.